On Saturday, NHL and JSL got some delayed Chanukah presents from family members that had come into town. While JSL got a Monsters University playset, I was much more excited over NHL’s gift: Settlers of Catan. I’ve wanted to get NHL into gaming for a long time now. We played a couple of games of Nuclear War last year, but never got to play much more after that. This was the perfect opportunity. NHL began a game with his Aunt M and Uncle I, but Uncle I had to bow out of the game at one point so I took over his spot. NHL, Aunt M, and I played over the next two days. Both NHL and I quickly learned the rules and had a blast building roads, trading bricks for wood or sheep, and gaining victory points. In case you don’t know how to play, the hexagon shaped tiles are laid out in the game area and the number tokens are placed on top. The arrangement of these can vary from game to game so player’s strategy can shift from game to game. You place settlements, cities, and roads along the edges of the hexagons. When the dice are rolled, the tiles below the tokens with the matching number produce resources (wood, sheep, wheat, ore, or brick) for all settlements or cities bordering them. Resources can be traded or used to produce more roads, settlements, or cities. They can also be used to collect development cards which produce different effects. As you build roads, make new settlement, upgrade to cities, and/or collect various development cards, you gain victory points. The first person to get 10 victory points wins. At one point, Aunt M thought she had won but came up short. Then, NHL played a few masterful rounds and seized victory. He had not only played his first game of Settlers of Catan, but won and boy was he happy. Now, I think he might be hooked. 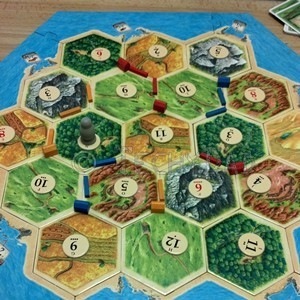 I believe we might need to have weekly Catan gaming nights. What games do you play with your kids?